External recruitment is the evaluation of open pool of job candidates, other than existing staff, to check whether there are any enough talented or able to fill requirements and perform existing employment opportunities. It is the way of looking outside of the existing employee pool to fill job positions in a company. A well-reputed company takes a decision which is going to favor that company in every single manner. And in one of the decisions like hiring a new candidate for the post offered, the company takes up two different sets of the selection process and that can be internal and external recruitment. Most of the time a reputed and successful company comes to a situation where they identify the need for the company and they go with an external recruitment process, where a new candidate will be hired for the post outside the company. Recruiting a candidate for any job role in a company is done by means of internal as well as external recruitment. Both these types have their own recruitment advantages and disadvantages. In that manner let’s glimpse through a few aspects of external recruitment. External recruitment is achieved through a number of sources where a few methods are through advertisement, colleges, universities, employment exchanges, through reference, factory gates, casual callers, labor contractors, labor unions, the central application file, former employees, walk-ins and more. External recruitment helps you to assess a pool of best or talented employees for the job you need to fill. This type of recruitment process helps in targeting potential candidates towards the firm. According to a survey, 8 weeks is the approximate time duration for an external recruitment process to conclude. Well, but there will be a number of factors that could impact the timeline slightly. In an external recruitment process, the company posts a job and invites different candidates suitable for the job outside the company. In this decision of hiring a candidate outside the company, the employer takes up a responsibility of finding a candidate who is capable of handling the duty and responsibility of the job posted. In this increased chance, the company receives a variety and number of candidates who owns knowledge and ability to handle that job. If the company enters a selection procedure with an external recruitment then there are increased chances of finding a suitable candidate for the job. This increased chance provides better availability of skilled and qualified employees for the company by using the external recruitment method. When a company goes with an external recruitment method, there is a quite better possibility of finding and identifying a fresher candidate who is capable of delivering new skills and inputs for the betterment of the company. Therefore, hiring a candidate with an external recruitment makes things clear and better for the company who is in desperate need of fresher skills and inputs for the overall growth of the company. Nowadays, when a company posts an advertisement in the social media or newspaper. One common thing they look for is a well experienced and qualified candidate. With an external recruitment advertising, the company can find a variety of qualified candidates for the post offered. And eventually, this process helps to identify the best candidates in a lot of skilled candidates. In the external recruitment process, there will be a chance of facing a better competition in terms of hiring a new talent. Most of the time some of the company looks for the candidates who are capable of handling a certain skilled job and some of them search those candidates who are better with their risk-taking ability. This is how the company meets those two types of characteristics of candidates in the same interview process. Most probably when the company is in need of those candidates who can provide creative ideas for the growth of the company, then the company needs to go with an external recruitment process for the overall development of the company. Therefore, once the company understands the working nature of an external recruitment then there is a possibility that the company might select a candidate with new and better creative ideas. In the external recruitment process, there is a very less possibility that the candidate might face internal politics of existing candidates. And these lesser internal politics avoids a number of internal issues and requests of the existing employees of the company. Once the candidate is selected, then the company can be aware of all the political and internal disputes of the company as well. Therefore, it is a process with a high potential candidate who is capable of handling any type of situations in the company. By using an external recruitment process, the company can expect growth not just for the candidate, but actually, the company can expect it for itself also. When a company selects a candidate with high potential, then there is a higher possibility of overall growth of the company. The employees within the organization also broaden their capacity and may try to match with the new talent. Therefore, external recruitment holds on to the objective where it handles the selection procedure sorting by finding a skilled and qualified candidate for the position offered. When employees are recruited through external recruitment, there whirls a competitive spirit in the organization amongst the employees. They present themselves to be competitive with full enthusiasm to work and match with the new employees. A healthy competition takes place between the internal and external employees and employees become efficient and trained. External recruitment paves way for a fair means of recruitment. Since the competition is open and wide, there is more opportunity for candidates where they can apply for vacant positions in organizations. The recruitment is done in a fair manner equally for all candidates where internal politics is avoided. Another smart factor that can be observed from candidates recruited from external recruitment is that they offer unique and new ways which are followed in the competitor or other companies they worked for. The organization can gain insight into various other aspects of other industries by means of external recruitment. These disadvantages of external recruitment make a clear distinction between its limitations and it will also provide beneficial knowledge about the techniques of an external recruitment process. When a candidate is selected from an external recruitment process, there is a possibility that the candidate might have less chance of understanding the environment of the company. And this lesser understanding can make a big difference in the future activities of the company. Therefore, there is some sort of issues with an external process which needs to be rectified for a better understanding of the company environment. There is a possibility that the candidate selected for the post is not worthy of the position offered and he/she can take advantage of their position in the company. This type of risk is very much common in an external recruitment process as most of the candidates applied for the job is total strangers to the company. And that is why it is considered one of the higher risk processes of recruitment. The main disadvantages of external recruitment are that it is time-consuming as most of the companies post an advertisement for their company recruitment drive. Then there is a quite possible chance of receiving a higher number of applicants for the post and the recruiter need to be very careful with their decision of selecting the best candidate for each round selection process. These different rounds of selection take a bit longer than the internal recruitment process as it involves a number of processes. As most part of the external recruitment process mainly deals with complete new candidates then the company need to come up with a pay scale for that candidate which should value his/her skill and ability. This can turn things a bit costly for the company as they are in need of new ideas and to get such new and creative ideas from the potential candidate. The company needs to provide him/her the best possible deal to refuse. With all these aspects, the company needs to provide intense training for the candidates. Screening a large number of candidates consumes more money. When a company considers a fresh candidate for the higher post than the existing candidates, then there is a higher possibility that the company existing employees might show some sort of internal dispute among the officials of the company. This kind of internal dispute can lead things to a completely different level. And eventually, the company can fall on their back with such differences of opinions. There are a number of possible ways where the new employee recruited may not adjust to the new environment. They also would not adjust with the new employees in the organization. When such scenarios take place, they have to leave the organization or the management should take initiatives to replace them. By this way, the management may lose good employees and need to hunt for another. By recruiting candidates through external recruitment, recruitment agencies play the role where they do not have adequate knowledge about the culture of the organization and their intrinsic qualities. They also do not care much about the key requirements of the post. External advertising methods are something that happens in large scale through print media and hence a large number of applicants who are not fit for the job post are drawn in. There are a number of unsuitable candidates who line up for low-level job positions. There are chances for legal issues when external recruitment is carried on. When hiring intact teams, top hiring talents are recruited with non-compete recruitment which may lead to legal issues. When external recruitment is considered, there is a large pool of applicants who are met. Applicants with varied experience, background, skills, and abilities are met. Since there is abundant talents met, picking the right candidate can be muddling. In this way, new decision making and planning aspects can be discovered. 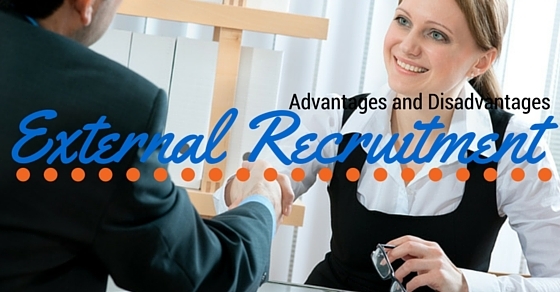 These are a few hints which mention the advantages and disadvantages of external recruitment. Employees and employers must make sure that there are good and bad aspects when external recruitment is considered. All the negative hints can be made positive by talking about a few steps of the external recruitment process and working towards it. Disputes come to an end when every factor is viewed in a positive manner. External candidates are beneficial in a number of ways as they make the company productive with their talent and skills. With external recruitment, the organization is able to develop a diverse team wherein there are new talents and skills who work together. Employees work together to make achieve the goal and objective of the organization unitedly. Employers and employees must welcome external recruitment in their organization and make it a practice in the company’s recruitment process. And the bottom line is that at the end of this discussion about the advantages and disadvantages of an external recruitment process, a common candidate can avail the knowledge about the limitations and benefits of the recruitment process. And if any interested candidate needs to know more about the benefits and limitations of external recruitment, then they can follow all the above-mentioned details about the external recruiting system.